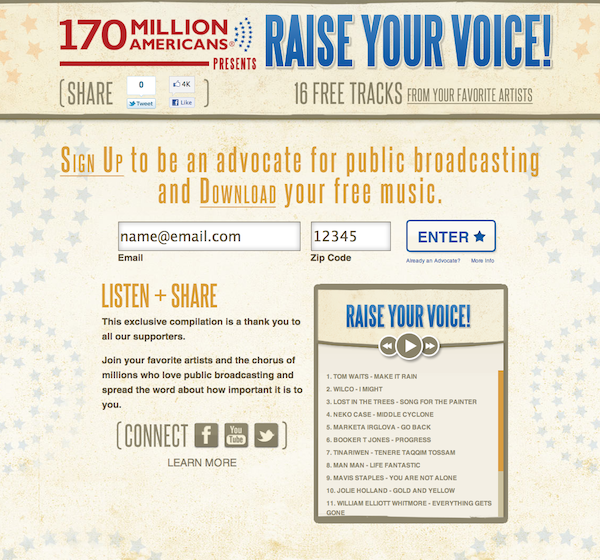 170 Million Americans for Publich Braodcasting is a collaboration of public radio and television stats ions, national organizations, producers, and viewers and listeners throughout the country in favor of a keeping strong public media present in the United States. The Raise Your Voice campaign is a project put together to rally a base of supporters to continue the force of this movement and we’re so excited to get to be involved. You can also check out the RootMusic BandPage (Facebook.com/170Million) and YouTube re-skin (Youtube.com/170Million) that we did for them.